File contains clippings and photocopies of news stories, dated April 21, 1975 to September 1975. Topics discussed include contracts, strike actions, suspensions, negotiations, and crossing picket lines. 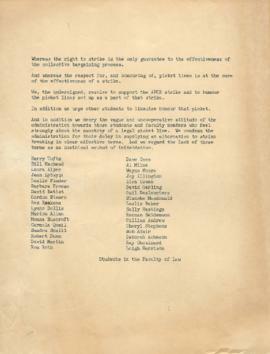 File also contains a letter from Students in the Faculty of Law supporting the AUCE strike, and an AUCE Local 1 (UBC) newsletter dated September 1975. Items containing third-party publications have not been digitized.